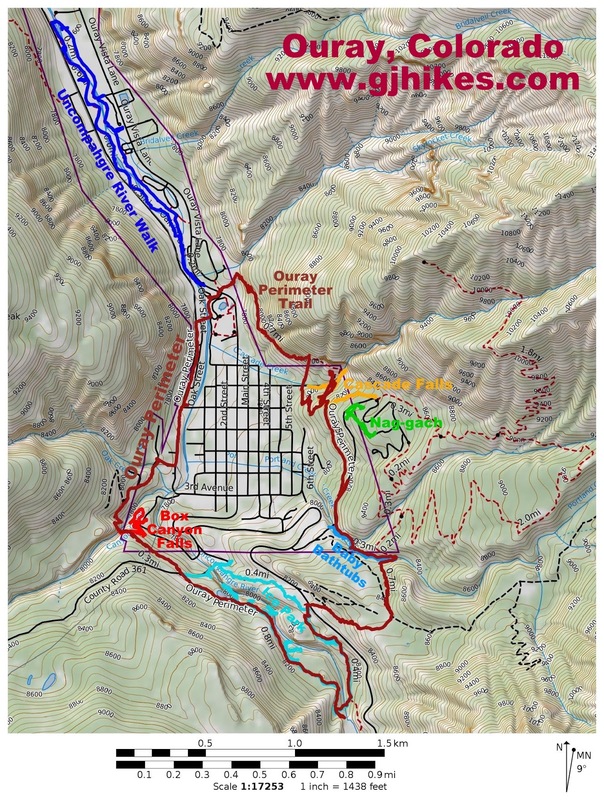 The Baby Bathtubs trail is located in Ouray, Colorado. The trail begins off of the Amphitheater Campground Road where it travels along a small gorge and stream sharing routes with a section of the Ouray Perimeter Trail. The trail is a favorite for both young and old especially families with children that enjoy a chance to frolic along the stream. To get to the trailhead drive south through Ouray and turn left at the second switchback at the Amphitheatre Campground sign. Follow the road for a short distance to where it crosses the bridge over the gorge. Park wherever you can find room enough to do so without blocking the road. The trailhead is on the right. The trail passes a registration box as it starts out from the roadway. There are numerous side trails that lead over to the stream. Some of them are covered with scree making them a bit precarious in spots. In other places the side trails lead to the edge of the gorge where the views are great but you will probably want to hold on tight to toddlers and excited children. On a hot summer's day children are sure to enjoy putting their feet into the pools of water that collect in the potholes. The amount of water flowing in the stream will vary with the time of year and current weather conditions. The trail itself is a slightly primitive forest trail that is distinct and easy to follow. Toward the upper end of the trail some hikers choose to scramble over the rocks and boulders and follow the streambed rather than the trail. The trail passes a sign for the Portland trail and then comes to an end where a footbridge crosses the stream. The Ouray Perimeter trail crosses the bridge and continues on its separate way. 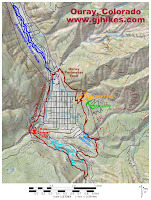 Ouray is known for steep trails that climb the near verticle slopes of the rugged mountains that surround the area. It also has a number of easy short trails, many of which are within walking distance of Main Street. These include the Ice Park, Box Canyon Falls, Lower Cascade Falls, the Uncompahgre River Walk, Nag-gach and the Baby Bathtubs. That is a nice variety to appeal to the area's many visitors. If you would like to see it for yourself then all you have to do is 'Take a hike'.